This August Royal Mail will be releasing a brand new set of stamps which will undoubtedly prove popular with collectors young and old. The stamp issue celebrates ten of the UK’s most iconic and beloved ‘Classic Toys’ from the last 100 years – from Meccano to Action Man. And although this brand new issue will undoubtedly evoke strong feelings of nostalgia across generations, given the variety it certainly begs the question, which was your favourite? Merrythought is a toy manufacturing company established in 1930. Its most famous individual bear was arguably ‘Mr Whoppit’ which was based on the “Woppit” character from the Robin comic in 1956. Sindy was the best-selling toy in the UK in both 1968 and 1970. With her wholesome looks proving a big hit. Originally designed by Dennis Arkinstall for Pedigree Toys and Dolls, she was modelled on an adolescent girl, and new outfits were issued every six months. Spirograph employs complicated mathematical formulae to create hypotrochoids and epitrochoids, using ‘rotor’ and ‘stator’ pieces. This sounds much too complicated for a toy aimed at children, but the mathematics works unseen in the background – all a child has to do is stick a coloured pen through a hole in one of the Spirograph tools on a piece of paper, twirl it around a few times and watch a pattern emerge. Awarded ‘Toy of the Year’ by the British Association of Toy Retailers in 1967. Stickle Bricks are primarily intended for toddlers and were invented in 1969. An individual stickle brick is a colourful plastic shape which is a few centimetres long and which has a “brush” of small plastic “fingers” on one or more edges. The fingers of adjacent stickle bricks can interlock, allowing them to be joined in various ways. The William Britain company originally produced lead soldiers but subsequently switched to plastic, acquiring a manufacturer of plastic soldiers, Herald, in 1959. The soldiers proved particularly popular in the 1970s, the key selling point being that they came ready-painted. US Cavalry, Greek warriors and cowboys and Indians were among the most popular characters. Although the origins of this concept are Italian, it was initially intended as an exercise device rather than as a toy and featured a wooden handle. The version we know and love was a British creation, from Mettoy who added the ribbed, antennae-like handles and the iconic kangaroo face, in 1969. The ‘Space Hopper’ name captured the imagination of children. Fuzzy-Felt was created in 1950 by Lois Allan and comprises a flocked backing board onto which a number of felt shapes – silhouettes or more detailed printed versions, it can be placed to create different pictures. Invented by Frank Hornby, this was originally marketed as ‘Mechanics Made Easy’ (1901), but the name was switched to the more familiar Meccano in 1907. Meccano retains the basic elements including the spacing on the perforations and the 5/32inch Whitworth thread on the screws, meaning that new Meccano sets can still incorporate old pieces. Meccano is one of the crown jewels of the British toy industry, although now French-owned, Meccano remains amongst the most collectable of British toy manufacturers. American toy firm Hasbro invented the concept of a doll that boys could play with – 1964’s GI Joe, with features based on decorated war veterans. The first dolls for the UK market appeared in 1966, initially named Action Soldier. Among the most popular are footballer kits and the Red Devil parachutist, Action Man was awarded ‘Toy of the Year’ by the British Association of Toy Retailers in 1966. A 2004 poll of the public to find Britain’s Favourite Toy placed Action Man at number 2. Frank Hornby first introduced the scale model train sets in 1920. Originally, sets were built on the ‘O-gauge’ scale (about twice the size of the current Hornby sets). Hornby’s genius was to switch to the OO-gauge (known as ‘Horny Dublo’) from 1938, which allowed for complex layouts to be built on a smaller budget and in a smaller space, taking into account the modest size of the average British living room. Hornby trains are able to appeal to many different character types across multiple generations. The ‘Classic Toys’ stamps are sure to be of interest to anyone who fondly remembers the iconic British toys explored in the Royal Mail issue. 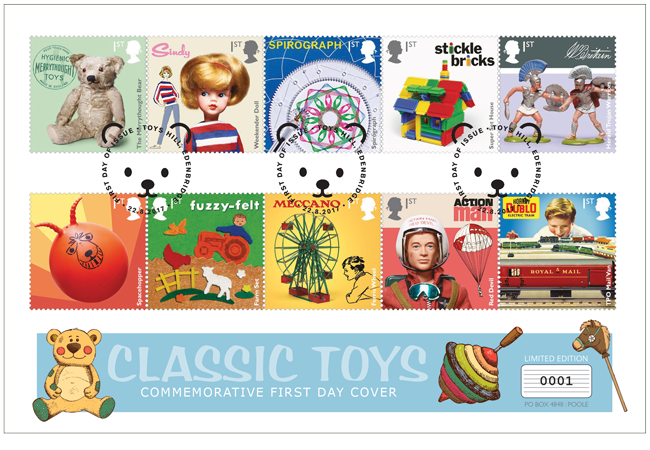 You can reserve all of the new ‘Classic Toys’ stamps now on a limited edition First Day Cover.